This SDS-Plus Rotary Hammer Drill has three settings and four applications. 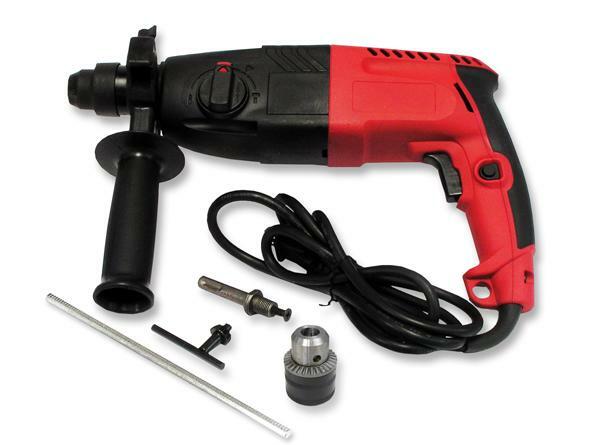 As a light weight and easy to use design (snap-in drill bits) you can drill through a wide variety of materials including concrete, rock, wood and even steel. Detachable front handle, quick release depth gauge and trigger locking function are incredibly useful. For long term protection, dust extraction prevents large accumulations of dust and the unit comes in a sturdy hard case with handle. Includes 3 SDS bits, 2 chisels, snap in standard key tighten chuck for non-SDS bits, depth gauge, carrying case.